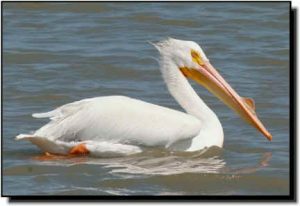 Comments: American White Pelicans feed on fishes, salamanders and crayfish and often fly great distances between feeding and nesting areas. They are common in the Great Plains, often seen cooperatively fishing on large water bodies and riding the thermals in sizable flocks during migration. During the breeding season, both sexes grow a horny knob on top of the bill. Knob size depends on the individual’s age and previous breeding experience and is shed after eggs are laid. American White Pelicans nest on islands on alkaline and fresh water lakes and reservoirs. There are several large colonies within the Great Plains, such as the one at Chase Lake National Wildlife Refuge, North Dakota. At approximately 3-4 weeks of age the young gather into large groups called crčches while adults are away feeding. Adults return to feed their own chicks, which they recognize from hundreds of other chicks. In flight, pelicans are easily recognized by their crooked, s-shaped necks, bulky white bodies, orange bills, short bright yellow to orange legs, short tail and black-tipped wings.